iPod files recovery software recovers lost music files from Apple iPods including Nano, Shuffle, Mini, iPod first generation to iPod next generation models lost due to accidental deletion or any type of human faults. GUI supported musical retrieval software retrieves music, songs, audio/video clips, pictures, photos or images deleted when updated or restored using iTunes software. ◉ Accidental music file deletion. ◉ Improper functioning of iPod media player. ◉ iPod is updated or restored using iTunes Software. ◉ Corrupted or formatted iPod device. 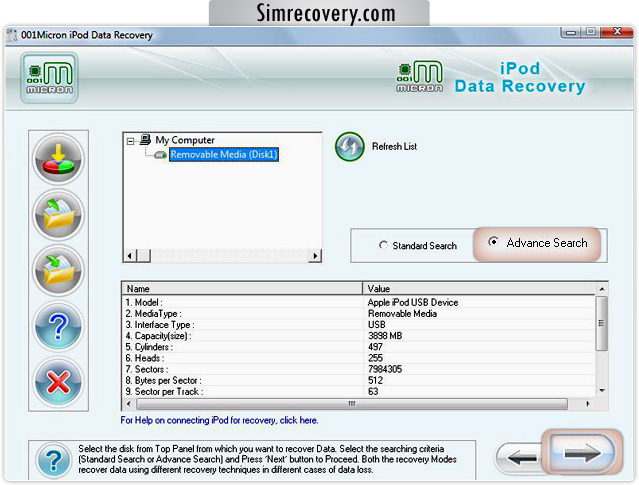 ◉ Data recovery when “Drive not formatted” error message occurs while accessing iPod device on your computer PC. ◉ Software is easy to use without requiring any prior technical skills. iPod Mini, iPod Nano, iPod Shuffle, iPod Classic, iPod Hi-Fi in all first to next generation series.